Learn the fascinating secrets that feet reveal about you, your partner, your family, the bloke next to you on the sunlounger on holiday or just anybody who walks past you in bare feet! Your trips to the shoe shop or the swimming pool will never be the same again. 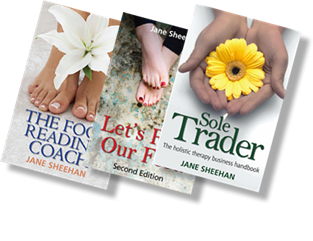 Foot Reading - The Portable Guide After you’ve learned how to read feet with either Jane’s first book “Let’s Read Our Feet” or her elearning course, then you may find "Foot Reading - The Portable Guide" invaluable as an aide-memoire. The first ever foot reading e-learning seminar is now available so that you can learn foot reading online at a time to suit you. Learning is more than just training and we want you to be able to learn whenever you want, at a pace to suit you. anywhere you can obtain internet access. This book contains everything that I wish I knew then, that I know now, about starting and running a holistic therapy business. Jane acknowledges that most holistic therapists enter their field because they have a passion for their subject but have gaps in their business knowledge. sign up to a free monthly e-zine "The Pampering Times" or read it under "Free stuff" then "Pampering Times" and click the logo. 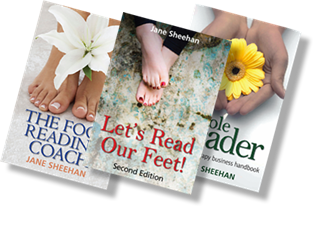 "Hi, my name is Jane Sheehan and I'm a foot reader." "Tell me three things about your feet"
They will then tell me all sorts of structural information about their feet e.g. Then I astound them by interpreting what they've told me and delivering it as information about their own emotions or personality. I'm not telling them anything they don't already know about themselves, but the fact that I've never met them before yet can tell them something they know to be true about themselves is what is so fascinating. And who doesn't love hearing about themselves? What I don't do is offer medical advice – for that you need to see your own healthcare professional. 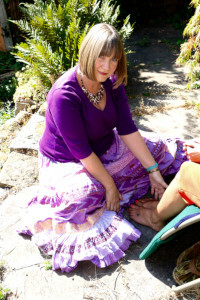 Foot reading (or solestry) is analysing the structure and texture of the feet to understand emotions and personality. The biggest misconception people have is to think you have to be psychic to be able to do a foot reading. It's nothing to do with being psychic. It's all about analysing the structure and texture and imbalances of the feet to understand someone's emotions and personality. I've taught children as young as 12 and adults from all walks of life. Check out my foot reading seminars on my Workshops page. You can even learn foot reading from the comfort of your own home via my new elearning seminar, by clicking here. The other misconception is that it will tell you about your foot health. If you have concerns about your foot health, see a registered chiropodist, podiatrist or your own doctor. Can you really read emotions through the feet? When you are angry, how do you walk? When you are happy, how do you walk? When you are depressed, how do you walk? Each of these emotions has it's corresponding walk. Over time you can see their impact on the feet. Of course, it's not just about emotions - each of these walks also has a physiological aspect too. But I'm most interested in emotions and personality. I am an author of three books which you can purchase via my shop and also act as a business mentor to therapists and a mentor to self-publishers. Reflexology Association of Canada has accredited Jane's workshops with 3.5 CEU's per day. Elearning also 3.5 CEU's.